I think BBJ has something wonderful in the works for the Weekend Mix, but I wanted to get this out there before hand. Think of it as the support act. I don't recall where I got this, but it's a personal fave. 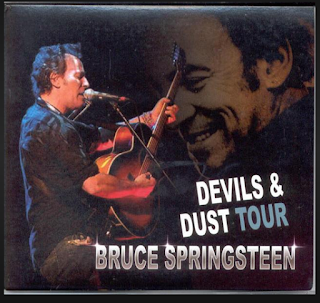 Over the course of Bruce Springsteen's "Devils & Dust" tour of 2005, he managed to play the entire "Tunnel Of Love" record. Here it is, sequenced seamlessly. "Tunnel Of Love" is an extraordinary collection of songs that must be talked about when discussing Springsteen's great body of work. These stripped down versions offer a different perspective and to my ears, evoke new emotions as they play on. This is a brilliant collection! Thanks! "Tunnel Of Love" is the last good collection of songs in his great run from "Wild, Innocent" onwards to this. But I always found the production of the album uneven to say the least. So this is a great chance to revisit those songs. It might be hard to believe, but "Tunnel Of Love" is an album I've never heard. The first time will be this mix. Thank you very much for this great live collection. I've always thought "Tunnel Of Love"was a much underrated album. Nicely assembled by somebody out there in the great grey yonder. Thanks for sharing. I recall being the only one in my small circle who liked the original album when it was released. As I haven't played it for years in its entirety the intimacy of these live tracks is like hearing brand new tracks. The devil is in the detail. Cheers! I find myself going back to Tunnel more than I thought I would and more and more as the years go on, it's really one of the most important pieces of work regarding love and love relationships, and some of his best song craft. Thanks for this. Many thanks. Really enjoying this one. This is a great argument for bootlegs and it's immediately superior to the album proper. And thank god -- I finally get to hear that track "When You're Alone' NOT as a group sing-along on the album or in concert, something that made absolutely no sense to me whatsoever. Now if we could just remove the yahoos in the audience who feel the need to shout out at quiet moments -- don't they realize, yeah, Bruce can hear you but he hears you and he's thinking "Schmuck!" It reaffirms my appreciation for this collection of songs and how the album as recorded slightly missed the mark as Bruce floundered between solo/E Street and the difference between the two. I've been compiling a similar live album version of "Nebraska" just out of interest to hear what a full band version of those songs would sound like (not that Nebraska has any need for improvement -- it's perfect). But I'm only pulling from official releases so it's not done yet. Filling their room with the beauty of God's fallen light"
Yeah, I know, it ties in to the line about God's light on "Valentine's Day" at the end, but it works more naturally there. here's what it is: intellectually, I always appreciated the album. Now with this, I can appreciate it and play it a lot more. Thanks!